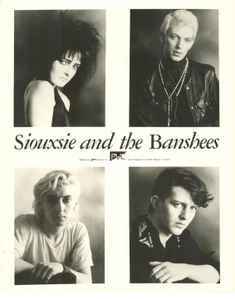 U.K. band, formed in 1976, fronted by Siouxsie Sioux (Susan Janet Ballion) on vocals, with Steven Severin (Steven John Bailey) playing bass and Budgie (2) (Peter Clarke) on drums (who also worked with Siouxsie as the band The Creatures). Guitarists for the band have included Marco Pirroni, Pete Fenton, John McKay, John McGeoch, John Valentine Carruthers, Jon Klein, Knox Chandler and also Robert Smith of The Cure (who also worked with Severin as the band The Glove). Martin McCarrick was the band's full-time keyboard player from 1987 onwards. They disbanded in April 1996.